Calendula brings gentle but powerful healing to troubled skin. Brew a stronger infusion than you would for tea when using calendula for externally and let it steep longer to get the most benefit. You can also use diluted calendula tincture if you don't have any flowers. 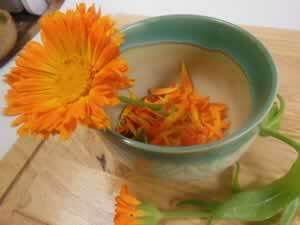 1- 2 tablespoons dried Calendula flowers or a handful of fresh petals per cup of boiling water. Or mix 1 to 2 teaspoons of calendula tincture per cup. Steep until cool and apply using a cool compress to the affected area.